Individual groups, and all project data, can be packaged for easy distribution. Locate the files that are to be included in the package, using Windows Explorer. Right click on the folder from which all files are stored. From the menu select Send To > Compressed (zipped) folder. The file name of the drivepkg file can also be renamed. A DriveWorks Pro module must be installed on the machine the package is being transferred to. Using Windows Explorer locate the DriveWorks Package File on the machine it is to be unpacked on. The file should be displayed with the DriveWorks Package icon. 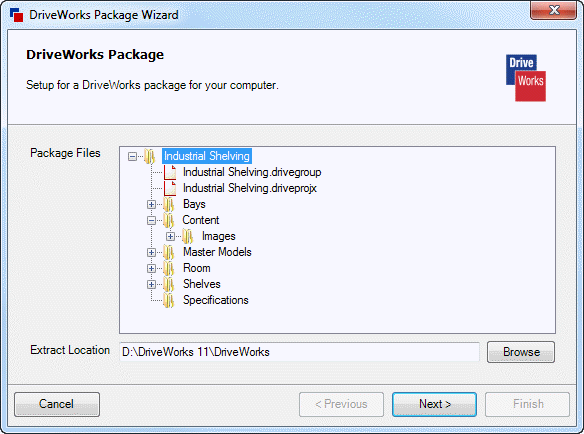 Double click the file to launch the DriveWorks Package wizard. The wizard displays all the files included in the package. Click the Browse button at the end of the Extract Location field. Browse to the location from which all packaged files will be extracted and click OK.
Click Next on the DriveWorks Package wizard to begin extraction. You will be prompted to Login to the group during the process. Supply credentials that have Administration rights for the group when this appears and click Log-on. Add the group to the Recent List. Remap the projects to the extract location. Remap components to the extract location. Remap specifications, documents and reports to the extract location. Remap released components to the extract location. The DriveWorks Data Management Tool will not be required once the DriveWorks Package wizard has been run. Open the group in the required DriveWorks module.